Our secure by design circular rooflight has been tested by leading independent testing facility, BRE (Building Research Establishment) and achieved LPS 2081:Issue 1 certification. This means that our rooflights conform to the requirements setout in The Building Regulations Approved Document Part Q (Secure by Design). The test involves a timed manual attack using various methods to determine whether the rooflight can withstand an attack by an intruder. To achieve secure by design Part Q certification, our rooflights are double glazed with an outer pane of clear toughened and HEATSOAKED safety glass and an inner pane of clear laminated glass. If required we offer blue, bronze or grey tinting or if preferred, an obscure finish for privacy or high performance solar control to minimise solar gain (heat) (g) and maximise light transmittance (Lt). As standard all double glazed units incorporate clear low ‘E’ glass achieving a centre pane U-value of 1.1 W/m²K. Unlike traditional ‘stepped edge’ glass rooflights where the outer edge of the glass is vulnerable to breakage, our rooflights fully enclose the double glazed units within the perimeter framework to eliminate this risk. The top surface of the double glazed unit is flush with the external face of the perimeter frame to allow rainwater to disperse rapidly, minimising cleaning and maintenance requirements. 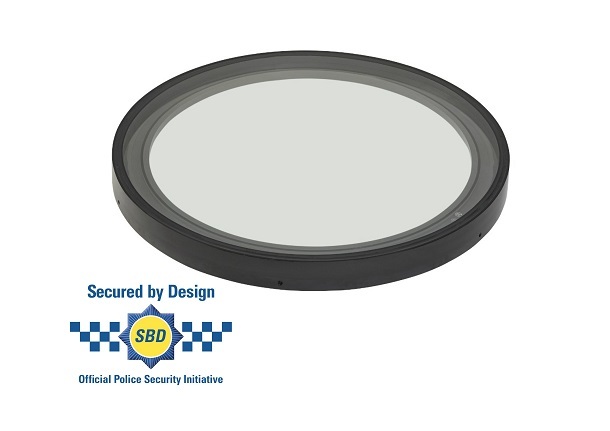 Our secure by design circular rooflight is structurally silicone glazed to give a sleek, elegant appearance with exceptional strength and rigidity. Our product is delivered fully assembled and is very easy to install. The framework of our circular roof light is manufactured from an extruded aluminium profile that is curved using our in house rolling machinery. This enables us to produce a wide range of circular rooflight sizes to meet your specific requirements. Very easy to install and available in sizes from 1000mm diameter to 2000mm diameter without the requirement for intermediate bars. Our circular rooflight achieves outstanding thermal performance. True U-value and Ud-value available upon request. The extruded aluminium perimeter frame is powder coated RAL 9005 black matt as standard. Other RAL colour options are available upon request.